Mojang has finally revealed its second title, a digital card/board game mashup called Scrolls. The second Mojang game that Marcus "Notch" Persson had hinted at in October 2010 has been revealed. Along with the completion of Minecraft, Mojang is currently working on a digital card game with board game elements called Scrolls. The design of Scrolls is being led by Mojang's Jakob Porser. Porser says that he and Persson had started to discuss the basic idea behind Scrolls five years ago. Now that Minecraft has given them the ability to make it, they're making it. Art is being handled by Markus "jnkboy" Toivonen, known for his incredible 16-bit mockups, and the backstory for Scrolls is actually being worked on by Penny Arcade's Jerry "Tycho" Holkins. I wouldn't hesitate to call that a dream team. Porser describes Scrolls as a "strategic game with a strong foundation in tactical game play but with a touch of random and chance guaranteeing a never ending stream of curve balls." Players will assemble a deck of "scrolls," which will be similar to cards, and constantly evolve this arsenal to defeat each new opponent in anything from smaller one-and-done battles to world tournaments. 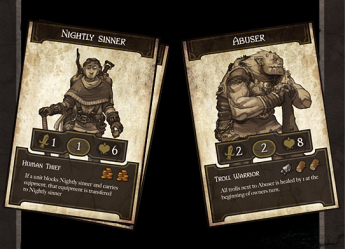 Scrolls will feature both single-player and multiplayer modes, and record each player's detailed statistics. Scrolls is played on an area similar to a chess board. Like most collectible card games, the player's goal is to reduce his/her opponent's health to zero. A proper balance of attack-based and defense-based cards will be necessary to keep a higher number in the wins column than the loss column. After release, Mojang will release new packs of cards to keep Scrolls fresh. An online auction house is also planned so players can officially buy and sell each other's cards. Mojang is adding a neat feature where cards will start to look older the more that they're used, perhaps adding a level of prestige for longtime players. Similar to Minecraft, there will be both alpha and beta testing phases for Scrolls that the public can get in on. However, they'll both be free. Mojang will invite certain Minecraft alpha purchasers to the Scrolls alpha, and then hold an open beta to help balance the game. This is the studio behind Minecraft here, so expect to hear a lot of new details as Scrolls continues development.